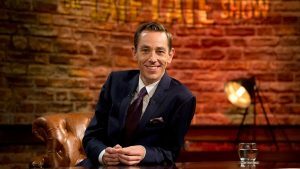 A charity CD in aid of the Society of St Vincent de Paul has been launched by RTÉ’s The Late Late Show, featuring 40 live performances from the show. 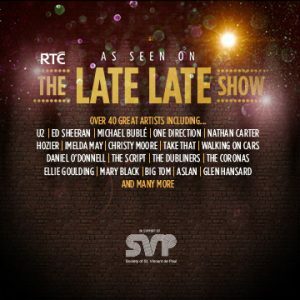 The As seen on The Late Late Show double album features probably the most eclectic collection of musicians ever released on an Irish CD, with individual performances of particular interest to keen music fans of every genre. For example, one of the highlights is ‘Four Country Roads’ performed together by some of the biggest names in Irish country music – Big Tom, Daniel O’Donnell, Nathan Carter, Philomena Begley, Sandy Kelly, The Three Amigos, and TR Dallas. Other team-ups include Walking on Cars and the RTÉ Concert Orchestra performing ‘Speeding Cars’, and Damien Rice and the Dublin Gospel Choir singing ‘Trusty & True’. Finbar Fury, RTÉ Cór na nÓg and the RTÉ Concert Orchestra perform ‘The Little Drummer Boy’, which is to be released as a charity single in the run-up to Christmas. For New Romantics, there is a solo recording by Midge Ure of ‘Vienna’, while lovers of folk will want to hear Christy Moore singing ‘Delirium Tremens’. Other big names include U2, Michael Bublé, Robbie Williams, Ellie Goulding, One Direction, Josh Groban, The Script, 5 Seconds of Summer, and Ed Sheeran. All artists and their record companies, and RTÉ, will donate their profits from the album’s sales to the SVP. “This CD provides a very unique opportunity for people to help SVP provide support for those in need in communities throughout the country,” said the society’s national president, Geoff Meagher.